What Does Google's "Page Layout" Algorithm Update Mean For My Site? Google’s most recent search algorithm update – dubbed the “page layout” algorithm change – focuses to punish websites whose content is pushed below-the-fold by multiple advertisements. While the forecasted number of searches affected is less than 1%, it’s never a bad idea to use an algorithm update as an opportunity to take a step back and examine your site’s search engine friendliness and usability. It is not an occasion to panic, however. Chances are that your site complies with the updated page layout standard. If it doesn’t, it would be hard for me to believe that this change is anything but a blessing in disguise. As Distinguished Engineer, Matt Cutts points out in his post on Inside Search, placing ads above-the-fold isn’t exactly uncommon. In fact, many of the most highly trafficked and well respected online information hubs use above-the-fold ads in optimizing their monetization strategy. Hosting doesn’t pay for itself. 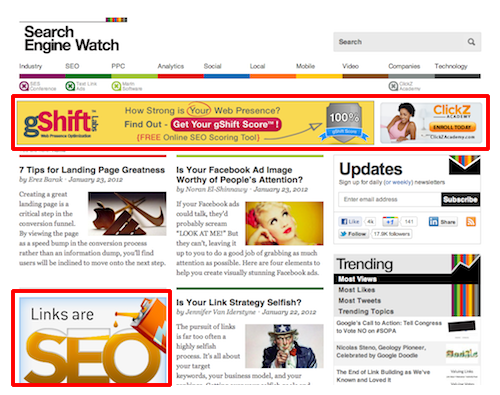 So, will industry websites like Search Engine Watch (which has multiple ads above-the-fold) be punished? Will your site – the one with a big, flashy banner ad at the top – be punished? Unless you’re supplanting your above-the-fold content completely, it’s incredibly doubtful. In his post on Search Engine Land, Danny Sullivan makes the point that Google actually encourages the use of above-the-fold ads through their AdSense recommendations. The onus, now more than ever, is on the publisher (or webmaster) to make sure that these ads are used tactfully and in conjunction with actual content. Long have Google’s algorithm updates catered to the end user (and rightfully so). If your site is guilty of having a page layout that’s top-heavy with ads, it’s time to make some game-changing tweaks. Asking users (and now search engines) to simply “deal with it” isn’t an option. Frankly, if you’re at all vested in the performance of your site and the contentedness of its users, it never has been. As we’ve talked about before, here at LunaMetrics, conversions rely not only on getting visitors to your site, but also the content and usability of your landing and inner pages. Ask yourself: Is my website providing users with an enjoyable, fulfilling experience, while also serving its end purpose? While I wasn’t able to find any especially noteworthy examples of top-heavy ad placement when searching with Google (hmmm), we can compare the user experience that such sites offer (at least, initially) to that of a parked domain. Now, obviously, with a parked domain (like Cheeseburger.com), there typically isn’t any content being displaced by the above-the-fold ads. However, when a user lands on a page that’s dominated by banner and text ads, the effect can be discouragingly similar. A poor user experience and a terribly high bounce rate. Just as it is in crafting a gourmet cheeseburger, maintaining balance is vital to the page layout aspect of your inbound marketing strategy. Too little ketchup or one too many pickles can be the difference between whether or not a customer comes back for more. If you’re designing a new website or prepping for a redesign, keep this idea of balance in mind. If neither is an option, find a way to improvise. Remember, the functions of design go far beyond aesthetics. Think about things like ad placement, content-to-ad ratios, the elements of your page that will be visible above-the-fold, below-the-fold, etc. In doing so, you can provide the best experience for not only your users, but also those finicky search engine crawlers. If you’ve found your site a temporary casualty of the page layout update, rest assured that the fixes are relatively clear and certainly implementable. Get some quality content above-the-fold. Limit your above-the-fold ad placement. Redesign if necessary. Improvise if you can. Those are your priorities. Where there’s a will, there’s a way. 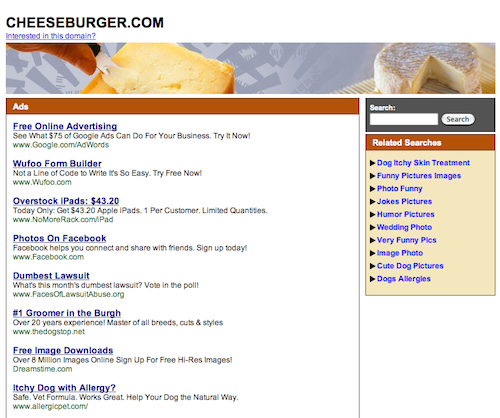 And where there’s a picture of a succulent cheeseburger, there’s a hungry search analyst. Off to lunch! If you’ve had a personal experience with one of your websites and the Page Layout algorithm update, we’d love to hear about it! Feel free to share questions and comments below.